We always have bananas in the house. Most of the time they get eaten in a timely fashion but sometimes they don’t. That’s when it’s time to get creative. Mash those puppies up and throw them in some pancake batter. Toss them into a blender with some yogurt or ice cream for a tasty drink. 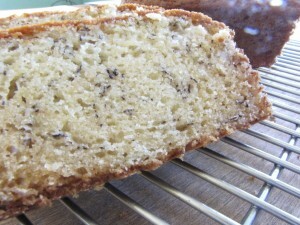 Or you can make some wonderfully moist Sour Cream Banana Bread. I’ve had this recipe jotted down on a piece of paper forever and figured I’d better post it before I completely destroy the paper it’s been written on with more smudges and spills from my messy kitchen ways. Preheat oven to 350F. Butter and flour a 9×5 loaf pan. Beat sugar and oil. After they are well blended add the eggs, banana, sour cream and vanilla. In a separate bowl mix the remaining ingredients then stir into the banana mixture. Do not over mix. Pour into pan and bake for 50-60 minutes. When a toothpick inserted into the middle comes out clean, the banana bread is ready. Cool on a rack for 5 minutes then carefully turn onto the rack. At this point if you’re impatient like we are you will cut off a hunk, slather with butter and stuff into your mouth. If you are more civilized, you can cool to room temperature and enjoy. Either way works for me. I recommend this recipe because it always comes out nice and moist. I suspect it has something to do with the sour cream. At least that’s my story – and I’m sticking to it.